Those were the last words heard on the radio transmission from David Johnston before he perished in a lateral blast of rock, steam, and gases. On Sunday, May 18, 1980 at 8:32am, Mount St. Helens had a violent eruption for the first time in 123 years. The event killed 57 people, one of which was the 30 year old volcanologist David A. Johnston, who was monitoring the volcano from 5 miles away at Coldwater II (now the site of the Johnston Ridge Observatory). He was standing in for a fellow USGS geologist, Harry Glicken, who had a meeting that day about his career. The irony is that David was the one who feared St. Helens the most, and repeatedly warned people; referring to it as a "dynamite keg with the fuse lit". His warnings may very well have saved thousands of lives. David Alexander Johnston was born on December 18, 1949 at the University of Chicago Hospital. The family lived in the south Chicago suburb of Hometown, Illinois for a short time before moving to Oak Lawn, Illinois. He went to the University of Illinois in Urbana to major in journalism. After getting discouraged with that, he took Geology 101. He became highly interested and pursued it further. 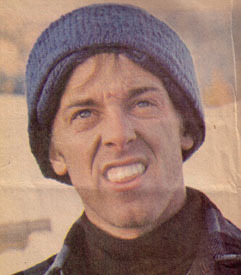 In 1971, he graduated with "highest honors and distinction" in geology. That fall, he enrolled on a doctoral track in geology at the University of Washington. During that time, he was president of the UW running club and worked as a teaching assistant. While at the University of Illinois, David made a friend named Doug Lalla, (an Anchorage, Alaska seismologist) who later introduced him to Mount Augustine in 1975. He completed his doctoral thesis on the volcano's eruption later that year. He returned to Mount Augustine each summer for research till 1979. David joined the National Science Foundation in 1978, having relied on the agency's grants for much of his research benefitting the USGS. He was first based in Menlo Park, California, but did a lot of gas sampling (his specialty) in the Pacific Northwest. In 1979 he hired graduate student Harry Glicken when he opened a field office in Anchorage. They had planned to do work there during the summer of 1980, but that changed with the awakening of Mount St. Helens in March. 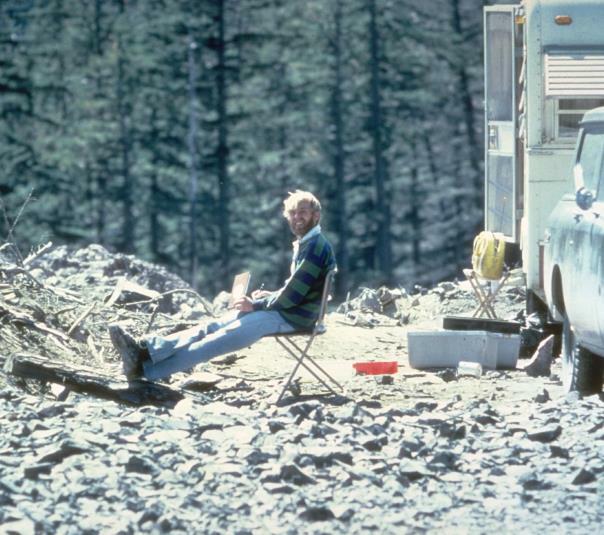 Soon after Mount St. Helens became active after 123 years, David arrived on the scene. For seven weeks following, he sampled gases from the volcano both in the air, and on the mountain; and spent time at the makeshift command center at the old Forest Service headquarters in Vancouver. The evening of May 17 David reluctantly agreed to replace Harry Glicken at the Coldwater II outpost, 5 miles north of the volcano. David knew more than anyone, the dangers of such a volatile volcano, and was extremely hesitant. Once he agreed, his love of his work took over and carried him through. At 8:32am on May 18, 1980, David Johnston's final words came through on the radio transmitter: "Vancouver! Vancouver! This is it!". The words of excitement, rather than fear; as David died doing the work he loved so much. "He had looked like a fearless lumberjack, his left hand clutching the stocking cap that covered his blond hair, his face in a grimace, squinting at the mountain. A small group of reporters, their eyes darting nervously upward at the peak, huddled around him. They were all standing in a parking lot 4,300 feet up the north side of Mount St. Helens. It was March 27, 1980." " 'I don't like this at all', said Dr. David Johnston as he squinted into the glaring snow on Mount St. Helens. Johnston, 30, of Menlo Park, Calif., was one of dozens of scientists who rushed to the mountain in March when it first burst into activity with a steam and ash explosion. 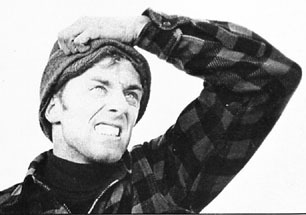 Although a veteran of volcanoes in Hawaii, Alaska and Iceland, the young geologist was clearly apprehensive as he surveyed the ash-mottled peak wih a group of shivering reporters at Timberline camp. 'I'm not trying to be an alarmist, and I'm usually pretty calm around volcanoes, but I'm genuinely afraid of this thing,' he said. 'I think it would be wise to get out of here.'" This site was created to honor Dr. David A. Johnston, as a lasting tribute to make others aware of his accomplishments in life, and to ensure he is never forgotten.